The 197bhp model accelerates from 0-60mph in 7.7 seconds, delivering fuel economy of 34.4mpg (8.2l/100km) and 186g/km CO2 emissions (NEDC equivalent). All engines are now equipped with particulate filters to make them cleaner. The filters are neatly integrated to the after-treatment system and trap ultra-fine particulates as the exhaust gases pass through. In a petrol engine, under normal driving conditions, the trapped soot will be oxidised into CO2 and the filter regenerated whenever the driver lifts off the accelerator. E-Pace is also the second Jaguar to receive the company’s AI self-learning technology, Smart Settings, that debuted on the I-Pace electric car. Smart Settings, offered as part of the Connect Pro Pack, aims to lean the driver’s habits and anticipates their needs, such as moving the seat to their preferred position and, over time, algorithms tailor to suit location, weather and behaviour, such as pre-heating the steering wheel and seats on a cold day. Up to eight profiles can be set up on the Jaguar E-Pace, making it suitable for fleets users and those who share their vehicle, the company added. Finally, the E-Pace is available with Adaptive Dynamics, which uses continuously variable damper technology to provide greater balance between handling response and body control. 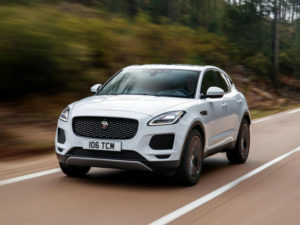 The Jaguar E-Pace is available to order at UK retailers now priced from £28,500, with the new 2.0-litre four-cylinder turbo Ingenium starting from £33,260.